How Do You Subtract Complex Numbers? 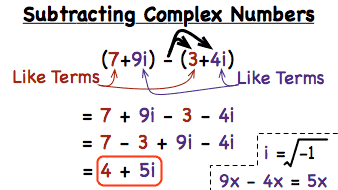 When you subtract complex numbers, you first need to distribute in the minus sign into the second complex number. Then, regroup the terms so like terms are next to each other. Combine those like terms, and you have the answer! Watch this tutorial to see a great example!